Registration Price: $20 for members and $25 for non-members. Note the price will increase to $30 for both members and non-members at COB Friday, October 19th. NOTE: BACK AT THE WESTWOOD CLUB!!! Main Street Station is the CROWN JEWEL of the Revitalization of Shockoe Bottom. It is the People’s Choice for 2018 for grand event space and in the near future will be home to our first downtown indoor urban market. The sister project to Main Street Station is the revitalization of her neighbor, the 17th Street Market which will open in November for the Downtown Grand Illumination. The design of the 17th Street Market evolved through many community engagement meetings and the design was influenced by places around the world but heavily by the one of the most famous market streets in Europe: La Rambla in Barcelona. These two projects collectively will provide the downtown with an indoor market and an outdoor market along our beloved cobblestones with the Virginia Capital Trail connector passing through it under 22 new oak trees lined with outdoor dining. The revitalization of the 17th Street Market has been in discussions since 1999 and in motion since the mid 2000’s. It has been a long time coming and had MANY hiccups along the way. Jeannie’s presentation will include an overview of the progress, the hiccups, the hurdles and the struggles to get this project open and an overview of what’s to come. Jeannie is a native of Richmond, Virginia and a graduate of the University of Virginia, School of Architecture. She also studied Architectural Design and Urban Planning in the UK at the University of London, the University of Bath and Prince Charles’ Huntington Center. Following Architecture School, she continued her studies at the McIntire School of Commerce at the University of Virginia and is a graduate of the McIntire Business Institute. Jeannie has worked at the City of Richmond for 28 years as a City Architect overseeing all aspects of project development. Her favorite projects include the 1995 Mosque Theater restoration, the Richmond Police Headquarters, the redevelopment of the 17th St. Farmer’s Market Plaza and the Richmond Slave Trail development including the Reconciliation Statue, the Lumpkin’s Jail Site archaeological excavation and the future development of the Lumpkin’s Jail Site/Devil’s Half Acre. Her favorite project and the reason she has stayed committed to work for the City of Richmond is the development of the Main St. Station Multimodal Transportation Center, a $92 million project that began in her first year at the city in 1991 and will take 40+ years to complete all phases and build out for high speed rail expansion in the US Southeastern States. 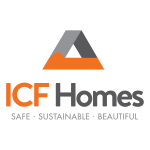 ICF Homes of Virginia offers our clients a variety of services, starting with a concept designing and building a custom one-of-a-kind home. We also offer house under roof phases where our clients can finish the home themselves. We specialize in Insulated Concrete Form homes, however, we offer traditional wood framed homes as well. For more information on how your company could sponsor future ASCE Richmond events please contact Nathan Sauer at nsauer@conteches.com.